Spiky blue thistle poke their heads through a bountiful bed of white roses and gardenias. Taking a simple flower like a white rose and adding a unique accent can completely change the look and feel of your wedding from traditional to trendy. Adding a strong shade or hue gives it that extra flare. Succulents and dahlias ,blue hen and chick flower. 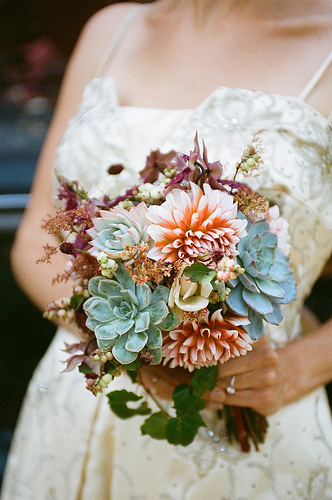 What makes this bouquet so amazing is not only the variety of colors but also textures. By adding a separate texture to your bouquet you are adding a layer of mystery and fun to your wedding day. The use of succulents and greenery can be a unique idea and also a cheaper one! Pristine snowberries! There are two things about this unique bouquet that make is so beautiful. 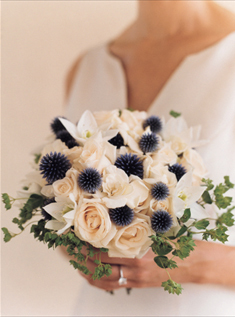 The use of one singular floral type is a classic look for a bouquet, consider using one that varies in color. You may have only one type of stem but by having one that varies in color you get extra added color without loosing the simplicity. The second great thing about this bouquet is the use of an unusual stem. Berries are not a normal wedding bouquet favorite but they are just as beautiful. Think creatively about what single flower or plant can add a wonderful touch to your wedding! Seashells the flowers of the ocean. You don’t just have to stick to seashells either. 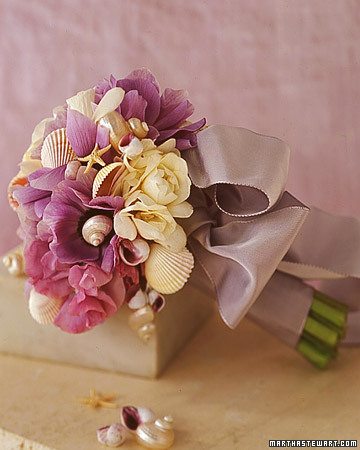 One of the up-and-coming trends in bridal bouquets is the use of items within your floral arrangement. You can add pins, jewelry, shells, fans, the possibilities are endless and as you can see the results can be stunning! 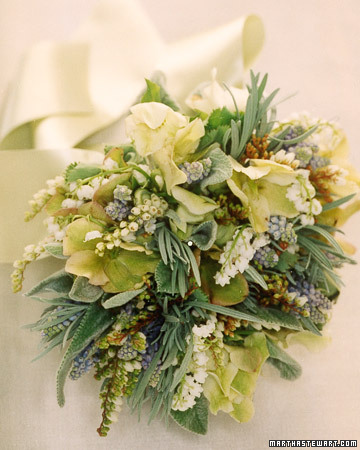 This bouquet has a variety of textures and colors, thanks to the mix of muscari (grape hyacinth), lamb’s ear, lily-of-the-valley, andromeda, helleborus, thyme, rosemary, sage, and scented-geranium foliage. 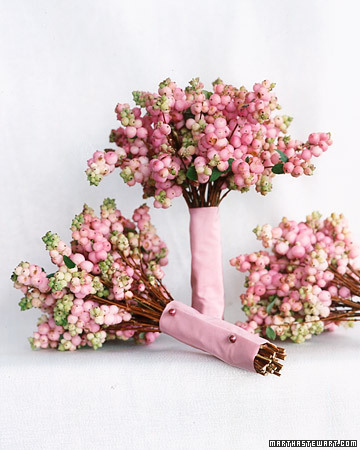 What is great about this type of bouquet is that not only is it beautiful and unique it can also be a cost saving alternative. If you are getting married in the winter or fall some flowers can be hard to find and make your day more expensive. By sticking with herbs and greenery you can save some money and have a fresh bouquet. No matter what your bouquet chose is, its all about making the day a great representation of your love for one another. So whether you chose a more traditional route or choose to have a jeweled bouquet, if its a representation of you as a couple it will be perfect!